Bring the traditional country feel of the old world to your garden or outdoor space with this beautifully handcrafted, fully-functional Amish goat cart. Big enough to carry firewood, mulch, garden harvests, leaves, and the largest seasonal displays you can imagine, this Amish Goat Cart Wagon is as versatile as it is durable. You can easily pull this wagon by hand or it can be used with actual goats. Try filling the wagon with Easter decorations, pumpkins, hay, Santas and gifts for Christmas and more for a beautiful way to enhance to your outdoor decor! Additionally, this particular wagon is constructed from un-sanded, natural weathered wood and uncovered fixtures, giving it a truly rustic look and feel. Choose from a wide variety of color options to find your perfect fit for your business or home decor. If you have any questions at all on our wooden carts for sale, please don't hesitate to get in touch - we would love to hear from you. You can reach us over the phone or at our Amish furniture store in Sarasota, Florida. 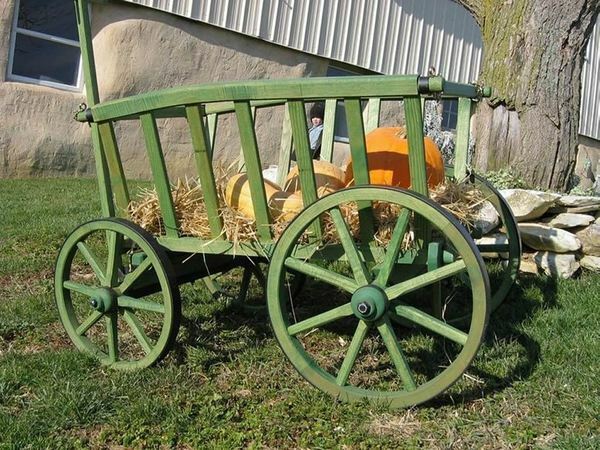 Some call these goat wagons pumpkin wagons. Width – Outside Wheel Hubs: 31 ½"
The box arrived as scheduled. We packed it directly into our reenacting trailer and will assemble it later this week.